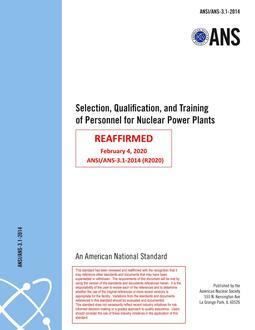 standard by American Nuclear Society, 11/20/2014. standard by American Nuclear Society, 01/01/2000. standard by American Nuclear Society, 12/22/2005. standard by American Nuclear Society, 08/20/2015. standard by American Nuclear Society, 01/01/2007. standard by American Nuclear Society, 03/20/2012. standard by American Nuclear Society, 01/01/1996. standard by American Nuclear Society, 04/29/2013. standard by American Nuclear Society, 01/01/1998.